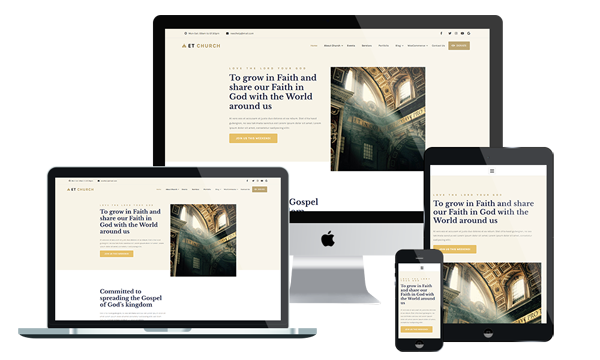 ET Church is a beautiful and solemn Church WordPress theme which has been specially designed for churches, organizations/communities of religion, any other relating and non-profit groups. This amazing theme has a strong base on powerful Genesis Framework, supports cross-browser compatibility combining modern and flexible elements like Parallax effect and smooth animation and in all formats type, therefore, you will save a lot of time for building and customizing your site. As a place for expressing respect for religion, ET Church has been designed with appropriate content organization for giving you ideas to introduce religion to a wider range of people on the Internet, as well as showcase highlight activities, community information, sharing knowledge and more. Church Website templates have shopping cart supported by Woocommerce for selling religious products and supplies online, easy and convenient. Besides, ET Church also appears flawlessly on all mobile devices, with stylish and modern layout in 100% responsiveness, all of your site content will display perfectly even on the latest model of devices. Don’t hesitate to come and get it now!